New York and I are coming up on our fourteen-year anniversary. As with all relationships, there are moments where I’m entrenched in the depths of my love, and many more where I take it for granted. Still others find me wishing I could run away, concocting elaborate fantasies of a better life. (“Trees! Mountains! A washer/dryer!”) Every time, I stop and ask, where else would I go? I have yet to find the answer. We’re all small fish in a big pond. Like many of my generation, I am a special snowflake. I arrived on this island wanting to leave an indelible mark. 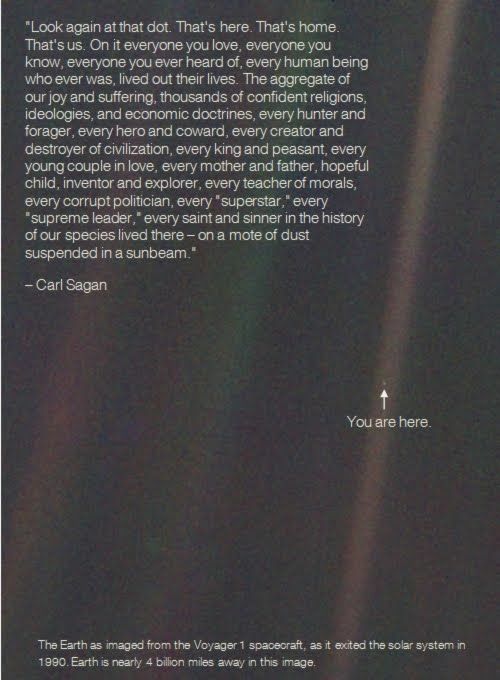 But living here can feel a lot like this photo of Earth from 4 billion miles away. The perspective knocks the wind from you, until it sets you free. “HEY!” shouts the city, from inside the shimmer of a thousand tiny windows. “I think we may have met before, but what’s your name again?” You are not — could never be — the central focus. You are always alone in a crowd. “On any person who desires such queer prizes, New York will bestow the gift of loneliness and the gift of privacy,” wrote E.B. White. And they are gifts indeed. Someone is having a worse day than you. To walk a mile in New York is to witness someone’s suffering. The person who asks you for change. The person who shoves you while boarding the 6 train. The neighbors whose nightly bickering passes through your living room wall. The city is a place of sweeping, alternating perspectives, constantly challenging where you fit in. Then one craptastic day, it’s your turn. You get heckled or injured or mugged. You lose someone you love. You are splashed by the classic meeting of bike tire and mud puddle. Whatever happens, you will survive. In its own sly way, New York has taught you how to do this all along. Someone is having a better life than you. Long before the filtered curse of social media, taking a walk through the Upper East Side or the West Village or the tree-lined streets of Brooklyn would send me into a tizzy. From the outside, everyone’s life appears incomprehensibly charmed. Screw keeping up with the Joneses when the Joneses are billionaires. Or when you encounter a supermodel buying a pack of sugarless gum at the very same moment you procure an economy-sized sack of Halloween candy (true story). Or the Times Square billboard promoting twelve stories’ worth of abs that are less realistic than the plot of Sharknado 2. New York taught me to say, f*ck the f*cking Joneses. There’s no time for that noise. No one else knows what they’re doing, either. Nora Ephron once wrote, “I thought [New York] was going to be the most magical, fraught-with-possibility place; a place where if you really wanted something you might be able to get it; a place where I’d be surrounded by people I was dying to know. And I turned out to be right.” When I came here, I hoped the city’s magic would rub off on me; that proximity to success and knowledge would encourage them to seep right into my being. What surprised me the most is not how wondrous the people are, though that is sometimes the case. Rather, it’s the many times those dazzling individuals have come right out and admitted they had no idea how to do their job, run their business, write that book, be married, raise a child, insert-large-undertaking-of-choice. What they did was start, then take it one day at a time. Buddhism teaches that all things are impermanent, that nothing is forever except change. This fact is quite evident when you live in a place where the skyline morphs on a monthly basis, where scaffolding is built and deconstructed so quickly it can feel like you’re trapped in a stop-motion film. You cannot control the tides. Often, you can’t even control your commute. So you adapt. You learn, however begrudgingly, to bend. You do this even when you’re harried and over-caffeinated and when “mindfulness” sounds suspiciously like something that hails from L.A.
You may glimpse yourself in everyone you meet. One of my favorite quotes is from Gandhi: “If you don’t see God in the next person you meet, it is a waste of time to look further.” I’ve turned this into a game and practice whenever I can. In the cab, on the subway, with my significant other. It isn’t always easy. But spotting humanity is more plentiful and fulfilling than Pokémon. After years of seeking solace in solitude, it was connection that gave me life. The answers are already inside you. The city is not quiet. The city is not still. Yet the city has shown me the wisdom in each. I used to wander through the streets, searching for signs. What was I supposed to do with my life? Should I stay in my relationship? Was I on the right track? I looked everywhere for validation, when it was hiding inside me. In the midst of the noise and haste, I learned to stop talking, to stop thinking, to sit quietly with myself and take stock of what I’m feeling. You may not find it immediately, and it may not be the easy solution, but if you listen closely, I’ve found the answer is always there. Wonder is a two-way street. On my first night in New York, I made new friends. I met a boy. I stayed out late. I saw the East Village bathed in moonlight and the skyline looming overhead. It was, up until that point, the most magical night of my life. It felt like everything was possible. Over the next decade, life happened, and my wonder all but died. Yet on all days — even days like this, when the humidity is stifling, the traffic is loud, and work feels like too much to manage — there is a glimmer that beckons: Come find me. Go for a stroll, hop on the train, but whatever you do, keep your eyes open. Somewhere outside your line of vision, there is Broadway, there’s a flash mob, there is Central Park. There is history in progress. There is one small act of kindness. There is your next great chapter. After all, this is the city that houses more people than 39 of the 50 states. The place that built the then-highest building at the lowest point of the Great Depression. The city where toilet paper was invented. The home of the first U.S. pizzeria, and eventually, the first pizza rat. I spent so much time waiting for wonder, so much time staying positive in the hopes it would appear. Until one day it whispered: No, kid, this is a two-way street. Your job is to find me. Your job is simply to notice. And when you do, I will visit you often. We’ve both kept our end of the bargain. Thank you, New York, for everything. I have a chalkboard wall on my baby’s closet door. Inspired by the door filled with wisdom from Franny and Zooey, I write down things that inspire me so I can stare at something while I give me son a bottle. The last quotes were from Big Magic. Today I erased those and added some from this post. Thanks for the inspiration. Thank you, Leslie. I am really touched. So happy you are back to blogging. You have a voice so full of wisdom. Even though I live thousands of miles from NYC (and have never been), there is so much truth about life in general here. You are quite gifted. Thank you. “After years of seeking solace in solitude, it was connection that gave me life”. I loved reading this, Caroline- always think your writing is lovely- and so refreshingly honest- and love your book posts. Your post, in particular, reminded me of when I first moved to London…! This is so beautiful. It may be because it’s almost midnight here in Europe and I have my cheesy Spotify playlist on, but I just teared up (and I’m not even from New York… but I have visited and fallen in love). Thank you, Caroline! Stellar writing, as always, Caroline. This is required reading for all New Yorkers, including those at heart. Sharing so many of these points with so many friends today! (This is also the only time I’ve ever encountered anything close to an error in your writing, Caroline: Gandhi, not Ghandi). Keep up your brilliant, brilliant craft. I will never forget reading this, because it’s beautiful… and also because today is the day that I found out I’ve been spelling Gandhi wrong for my entire life. Followed you from Cup of Jo. always enjoyed your precise, original voice. Glad to see it has transitioned easily on this new site. NYC sounds magical….and very real. Since we are new here, I truly walk around in wonder still, happy to be here. Thanks for sharing this. This is so beautifully written. Thank you for reminding us to search for the wonder right around the corner. Yes, yes, a thousand times yes. Wish someone had told me this a decade ago. This may be my favorite thing you’ve written so far. Beautiful. When’s your book out again? I love this. Please keep writing. I can’t wait for your first book. Isn’t it crazy and wonderful and brilliant that you, a person reflecting on life’s lessons in NY, can share you’re wisdom with me – a person sitting at a desk in a sterile London office, and inspire me oh-so much. Thank you. And please don’t underestimate the power of your lovely words. Sometimes, writing can be scary to me, or sharing my thoughts can make me nervous. If ever there comes a day when you feel like that too, then remember to be brave, because in this moment, you’ve made someone – who is miles and miles and miles away – smile. If you only knew how much I needed to read that exact paragraph. Unrelated to NYC in my particular situation entirely… but wow, is it ever true. Your writing is incredible! Looking forward to following. Wonder so is a 2-way street. Love the way you put it. Thank you! “After years of seeking solace in solitude, it was connection that gave me life.” Love this line, Caroline! I’ve really found that same realization myself. Hi Caroline! I check your blog every day hoping for a new post. I adore your writing so much and sometimes when I feel down I’ll go back and just read and reread. You’re so inspiring. Please post more often! I love this!!!! You’re sooooo awesome and I admire you so much! Thank you for always inspiring me with your words. <3 + miss you!! So happy to see you writing and thank you so much for this post. I’ve always thought about New York in the romantic, if-only-I-could-move-there-everything-would-be-lovely way. I’m from Miami and our lifestyle is more beaching and clubbing than walking and bars and museums, so I’ve always looked to the city with sparkling eyes. In a twisted turn of events, I ended up moving to Paris and I live every day with the guilt that I hate it. “Who hates Paris?” my brain constantly guilts me. Of course, it is one thing to go on vacation and another to spend two years there (or so I tell myself). I often try and look for the lessons it is trying to teach me, and sometimes I can’t come up with much. However, this post has really made it clear to me, when you are somewhere that you love and that brings you joy, even if it’s not all the time, you just know it. You see the lessons behind it, you appreciate even the struggles and the little annoyances, you can sort of whisper to yourself that you wouldn’t change it, like you said, you can’t think of another place. Anyway, it’s all about learning and finding our place right? Thank goodness you’re back. I’ve only just had a baby, finally sat down & realised you’re writing the blog again. Need more of your brilliant writing in my life. Real, honest, well-crafted sentences that says it like it is. Just like this post. Love your work. I love this. I just love this. Loved your text! I used to follow you on Cup of Jo, and I read your entire blog when Joanna linked one of your texts (the one on heart breaks, while I was going through a harsh one myself). I love to see you back to blogging, love your writing! Congrats!!! I wish I had read this last July before I moved to New York. I have lived many places in my life. New York is a beast I wasn’t ready for. I am going to process this past year for a while I think. I am sailor, and in two weeks time I will be on the ocean thinking about this city, your writing, and running circles in my head trying to figure out why I feel broken. I can’t blame a city, but I will say that the urgency of this place caused me to look in a mirror and wonder why I came and what I learned in the process. I am sure with some honesty I will figure something out. You have beautiful insight. Thank you again for writing. I miss your posts! Please, don’t stop blogging! I’m reading this while procrastinating and I can’t think of a less cliched way to simply say: I agree! You’re right! A few months ago I totally became jaded about NYC. What’s interesting about the place you live in? And then I reminded myself that everyday is a vacation if you let it be, Instagram isn’t just for interesting exotic things, *you* decide to be interested. My long winded way of concurring with the thought: It is a two way street. Also, this reminds me of the running list of things that gave me a Feeling of Awe (includes 1st time I tried Pinkberry as well as some fancy mountains) so that I remember that there’s never a reason to be jaded. A celebration of the absence of perfection.